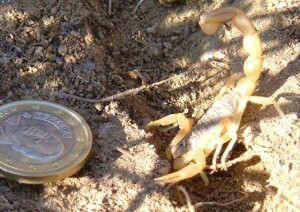 Lots of people are wary of creepy crawlies and various hazards when they come to Spain. In this area the snakes are not as dangerous as in the UK. The most common ones are either non-venomous or very mildly venomous. There are no adders in this part of Spain, these are far more dangerous than any snake in Almería. Best to leave them alone and remember that some are protected species. See the common snakes page to help you identify one you may have seen. Scolopendra, a black and orange centipede cause a few painful bites every year. 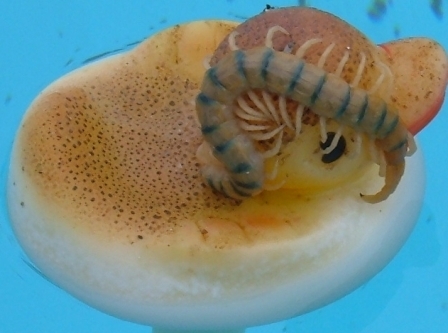 This one was in our swimming pool taking refuge on a plastic duck! 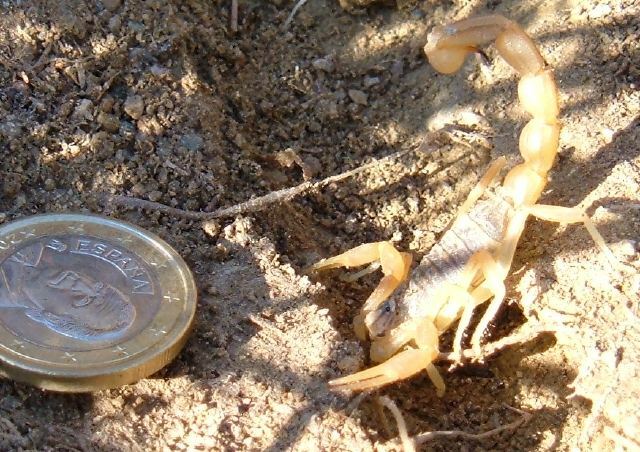 A few people are stung by scorpions. Take care when moving stones, gardening, or walking barefoot. This is a big risk. Keep out of the sun between 12:00 and 16:00 in the summer (April – September) and between 11:30 and 14:30 in the winter October – March). Keep an eye on the weather forecast for the UV index and use a high protection sunscreen, factor 20 or more. As a general rule if your shadow is shorter than you are, keep out of the sun.